"Sunflower Address Labels" product is already in your cart. 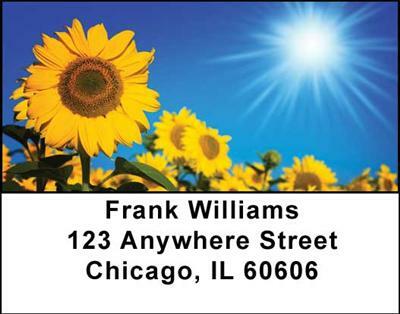 Let the sun shine through with these colorful Sunflower Address Labels that will add a bright spot to your mailbox. These vivid flowers show off their beautiful plumage as they raise their pretty heads towards the bright blue sky. Match them with the checks and you will create your own colorful garden of sunlight. These lovely scenes of fields of sunflowers all clustered together and individual ones that stand tall by themselves make a beautiful display. Your mail carrier will love them on the envelopes and it will bring a smile to everyoneï¿½s face when they see these Sunflower Address Labels.